HDMI Distribution Hub splits the HDMI signal to 4 HDMI displays. Connects 4 HDMI Displays at the same time to the same Video Source. Supports 480i, 480p, 720p, 1080i and 1080p resolution 1.3 and HDCP Compliant. Plug and play, installs in seconds. Note: Today's Entertainment systems all have HDMI outputs inputs, but this is currently the only way to supply a single source HDMI signals to more than one HDMI Component Input. Use an HDMI splitter to send multiple HDMI signals to other HDMI displays, inputs or HDTV's. A Multiple number of Displays/Inputs can be connected by Daisy-chaining Multiple Splitters together to create a larger number of Distribution Outputs (Inputs to Other Devices). These HDMI Splitters support both HDMI Audio and HDMI Video signals within the HDMI signal and are fully HDCP Compliant. The HDMI Splitter is connected using a HDMI cable from the HDMI source to the HDMI splitter input. 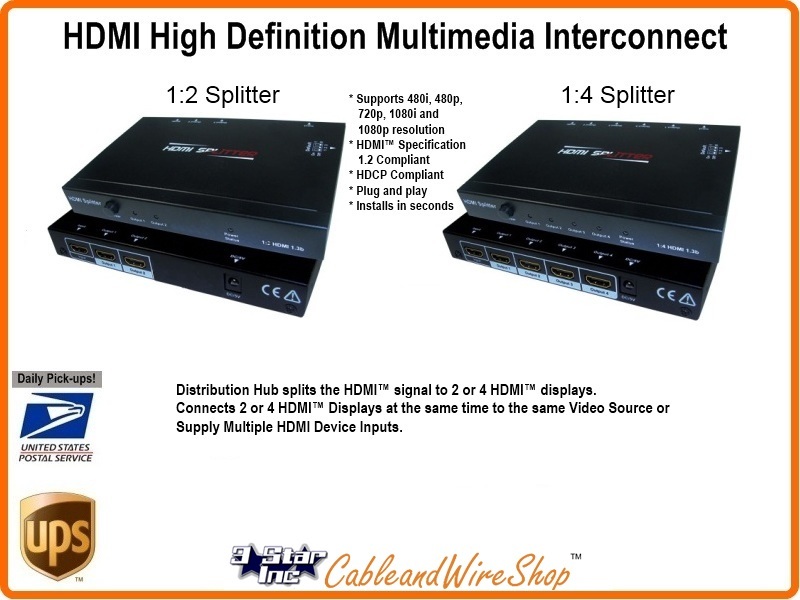 Then you connect 2 or more HDMI cables from the HDMI splitter output to you HDMI equipped HDTV or other device.